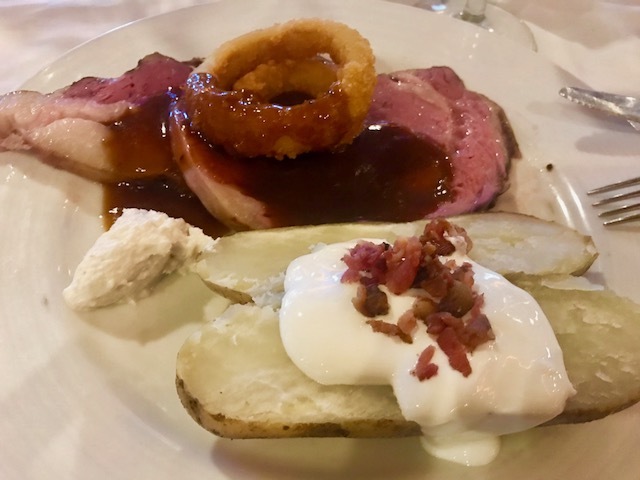 before heading to Ensenada on a 4-day Baja cruise..
My Dad’s prime rib with horseradish, onion rings and a baked potato side. 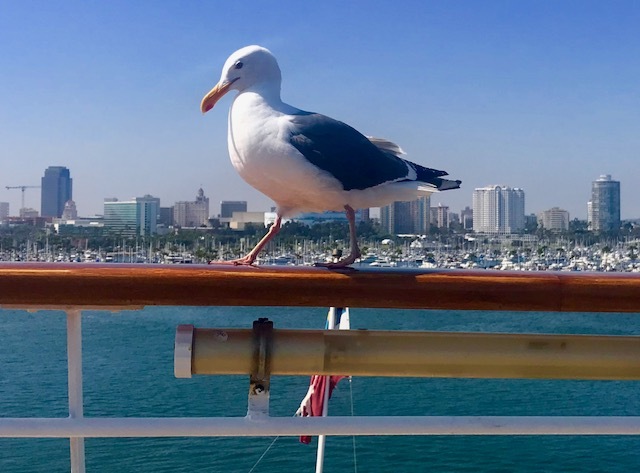 The food on our 4-day Carnival Cruise to Ensenada was fantastic. There were two dining options: you could eat at a food court or a fancy sit-down restaurant (the food was included in the price of the cruise). First the food court: it included a deli, pizza place, celebrity chef Guy Fieri’s gourmet burgers with toppings bar (I liked the smoky bacon bits and sautéed mushrooms), a taco/burrito stand, an ice cream machine, and a lot more. Also, each of these food places changed over for breakfast. 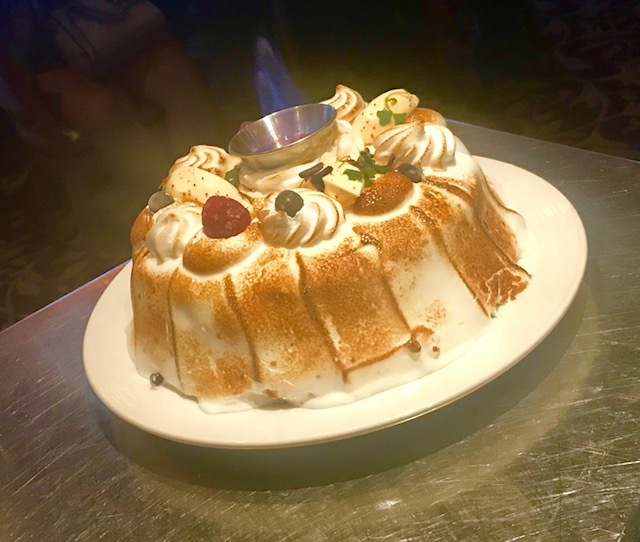 Baked Alaska (meringue ice cream cake with a flame in the middle!) for the final formal dessert. The sit-down restaurants for breakfast and dinners were my favorite because the food was delicious and our servers were extremely nice. The menu changed every night with delicious fancy foods. My two favorite appetizers were alligator fritters and escargot bourguignon. Yum. We went on our first cruise in 2014 so this time we had the chance to check out some of the things we didn’t do the first time. We chose to visit many new activities and spots such as the spa. 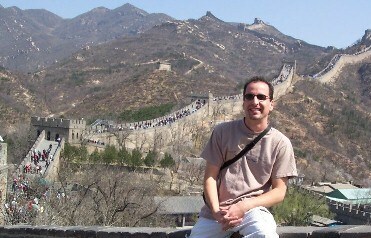 At the back of this area was the gym; after my mom and I worked out a bit, we went into the sauna and the steam room. Xander getting sprayed by La Bufadora! 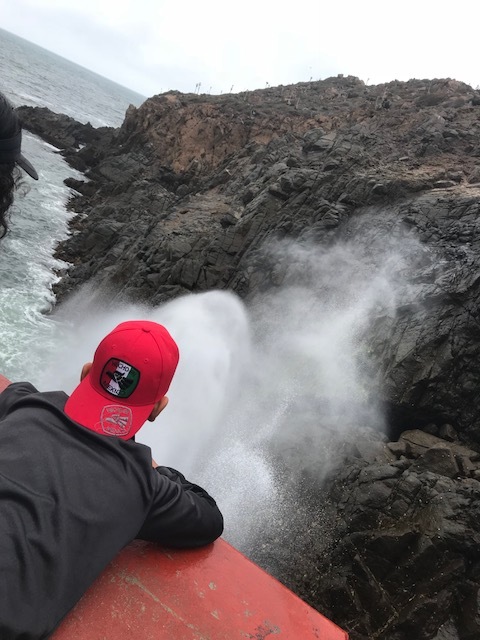 When our ship (named the “Imagination”) docked at the port of Ensenada on Saturday morning, we took a shore excursion to “La Bufadora” (The Blowhole). Our tour guide Gilberto led our group on the short walk to the natural geyser; we passed many small Mexican shops offering souvenirs and food and “Gil” gave us each a free drink sticker to the Habana Banana! We watched the geyser, which sprays sea water up from a small cave, shopped a bit and had a delicious lunch at the Habana Banana, where we all shared a platter of soft tacos , shrimp and clams. Shortly after lunch, we made our way back up the line of shops and got back on our tour bus to return to the ship. 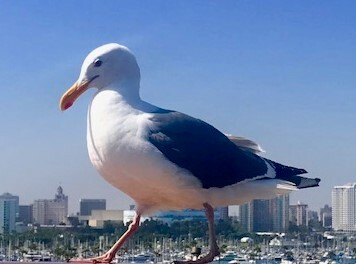 On Saturday night, we went to a rock ‘n roll show (held in the same cruise theater as the “Divas” show and featured the same performers) except the songs were rock and we watched from the upper balcony seating. My parents also got to have some alone time in the Serenity adult area in the very back area of the ship with two hot tubs and comfy lounge chairs while me, Xander and Troy were one deck above sliding down the waterslides in the mini-waterpark. Amazing Indian head sculpture carved in 15 minutes! 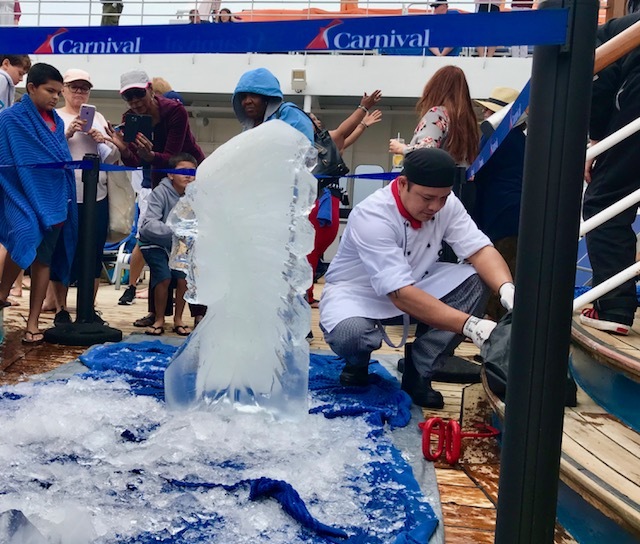 My dad and brothers also saw an ice carving show on the Lido deck where a champion ice-carver transformed a block of ice into an Indian-head ice sculpture in just 15 minutes. We also learned how to make towel animals with Matey (a dog and an elephant). 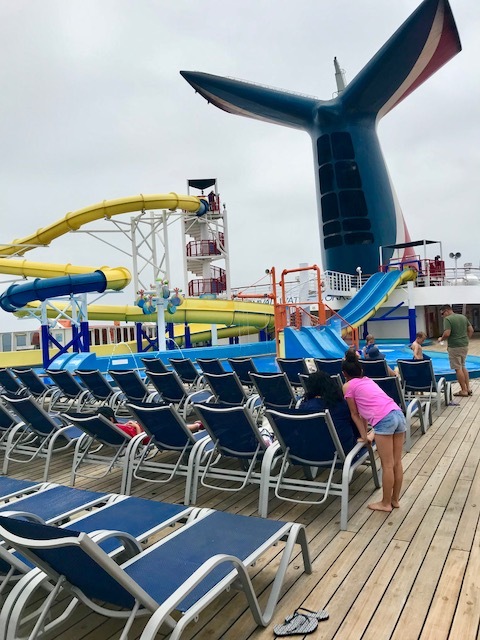 The new activities we got to do were so much fun and I thought it was nice to experience some of the things we missed on our first Carnival cruise.